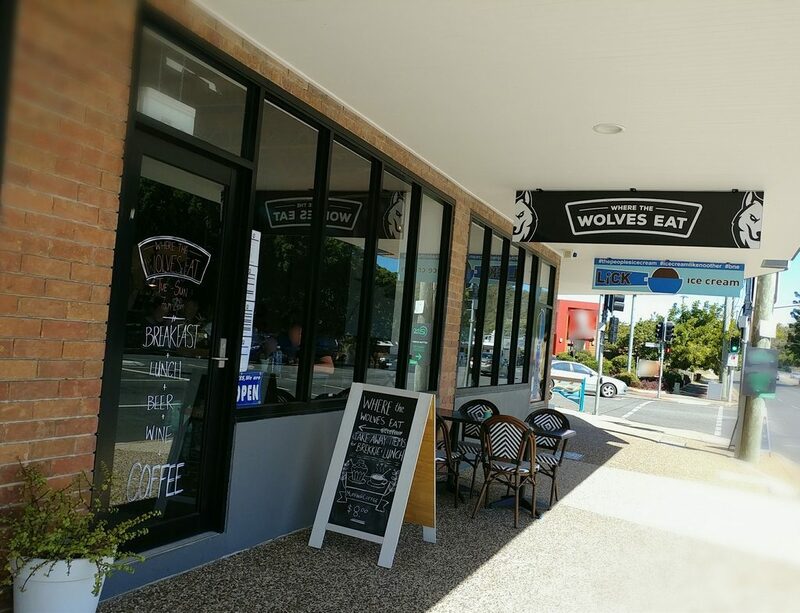 On the hunt for a weekend feed, we decided to try out Morningside’s recently opened Where The Wolves Eat, our interest piqued not only by their name, but also by their not-quite-the-usual menu. 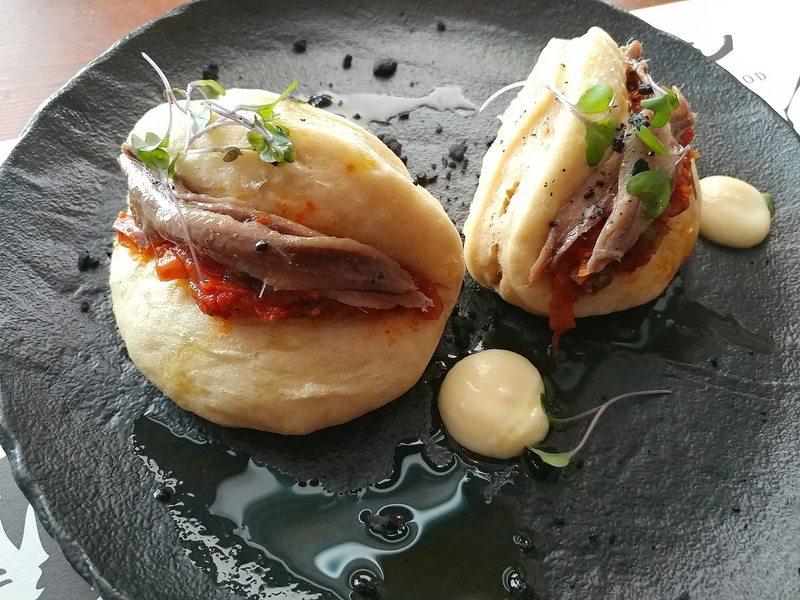 There are certain things we associate with wolves, and if one eats where the wolves eat, then surely one must be either hungry like the wolf (as in the 80s hit from Duran Duran), or else in the know, or a combination of both, which works out well for foodies. 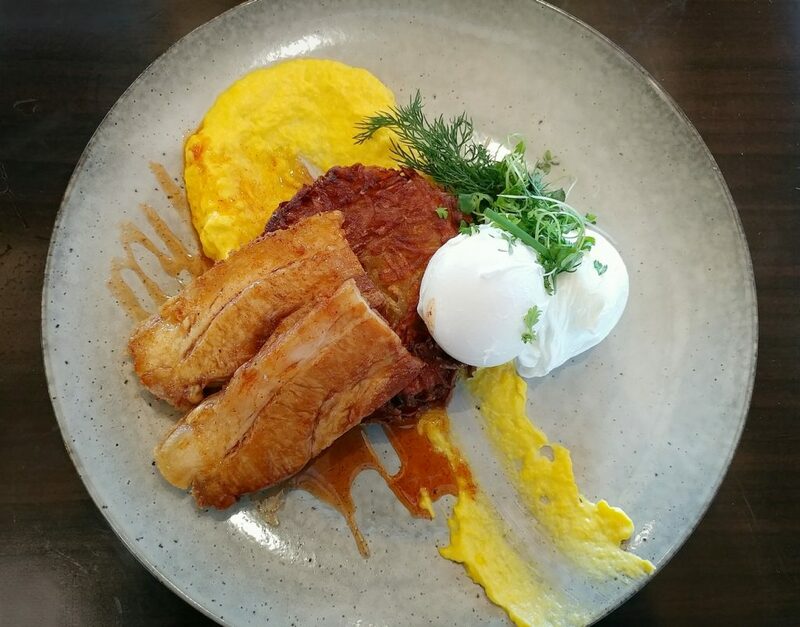 It is located along Wynnum Road, in the same shopping strip enclave as the Flour and Chocolate Patisserie and the Southside Tea Room. Next door to Lick! Ice Cream, you could even conveniently make that your second stop for dessert if you still had room. It is reasonably well signed as you approach it from the walkway, its name in white on black on a board hanging from above, and an A-frame next to the entrance pointing potential patrons in. The signs you will see from the walkway. 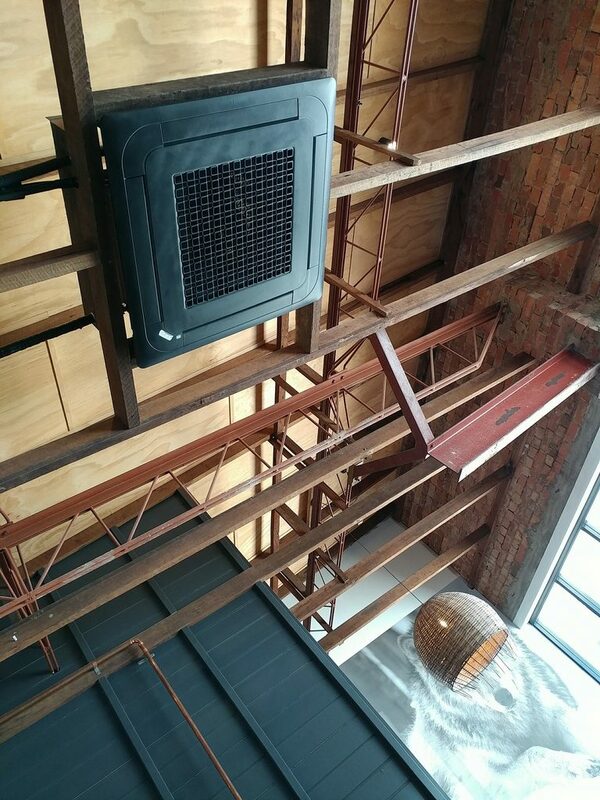 It had something of a rustic farmhouse feel as we come through the door, with exposed wood rafters, and sections of raw brick along the upper parts of the walls. 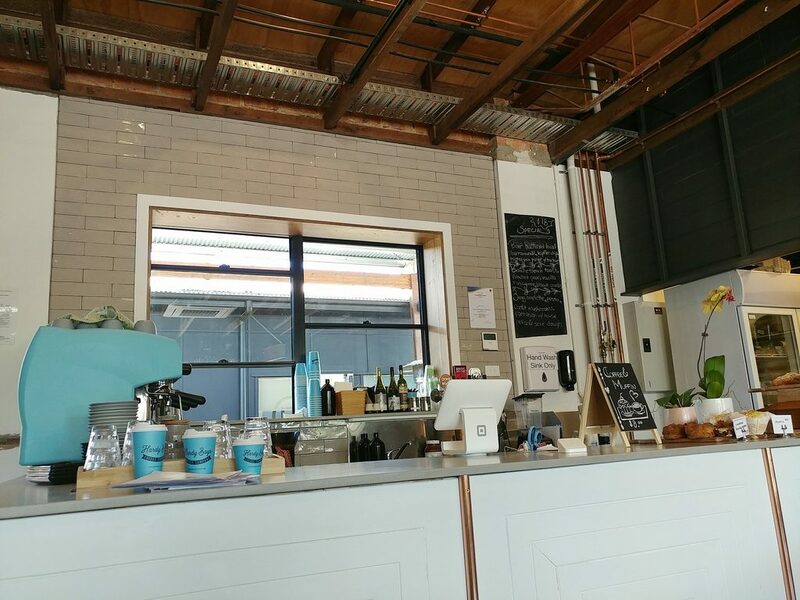 Polished concrete floors with exposed aggregate, and cross-backed chairs with light wood seats and backs complimented the look. The area housing the kitchen was painted slate grey for a more modern touch. A glimpse of the space, with the kitchen on the left. A couple of large pictures taking up most of the walls across from each other immediately caught the eye. One, running along most of the length of the interior space, depicted a snowy mountainous scene, with wolves along the ridge in the middle distance. 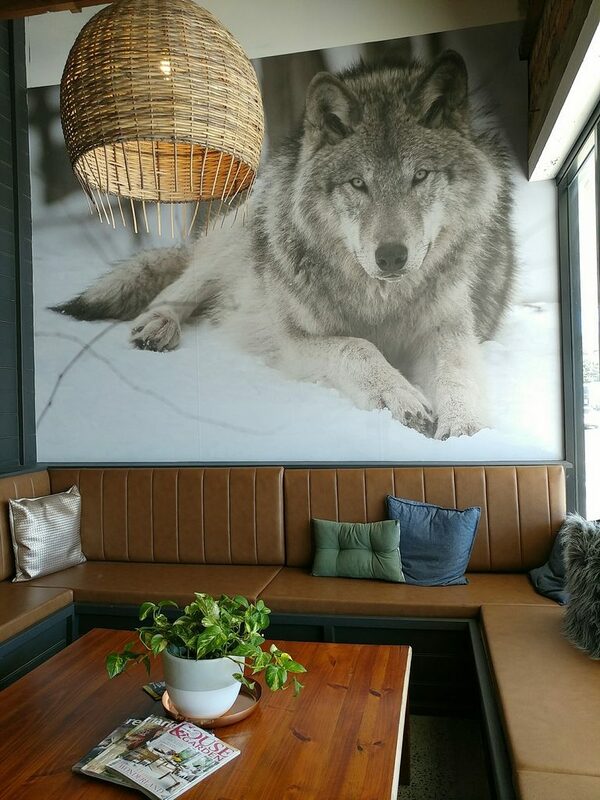 The other, in a rather cosy lounge-like area, had a close up of a wolf in repose. The wintery scene running along the whole of one wall. A wolf waiting to eat? 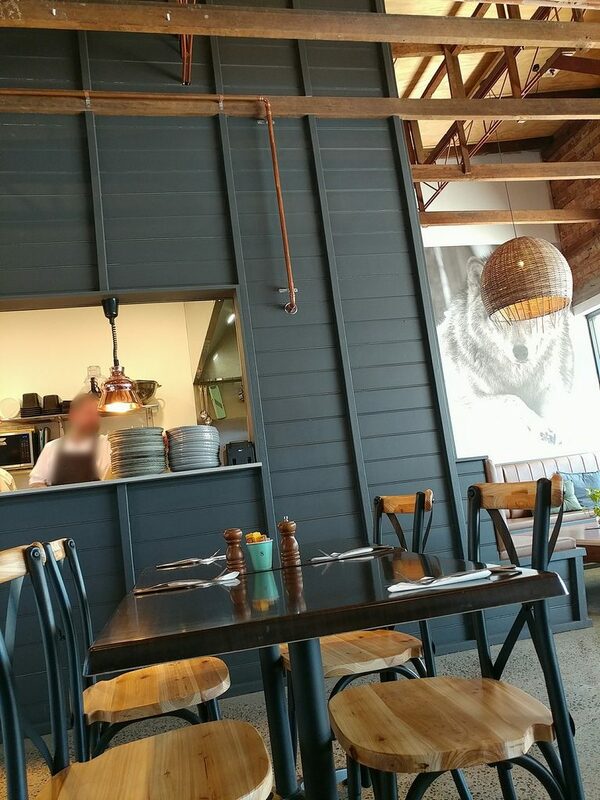 We were initially a bit bemused when we first came through the door, as there was nothing to explain whether one waited to be seated, or found your own table and went up to the counter to order food when ready. It wasn’t particularly busy when we first arrived, at about midday on a weekend, with just a couple of other tables inside occupied, but staff seemed engrossed in other conversations. We made our way up to the service counter and picked up menus, and were then noticed and invited to sit at whichever table we would like. Water and glasses were brought to the table, and we were asked if we wanted drinks to begin with. The service counter at the far end of the space, with specials on the board behind it, and pastries for purchase to the right. 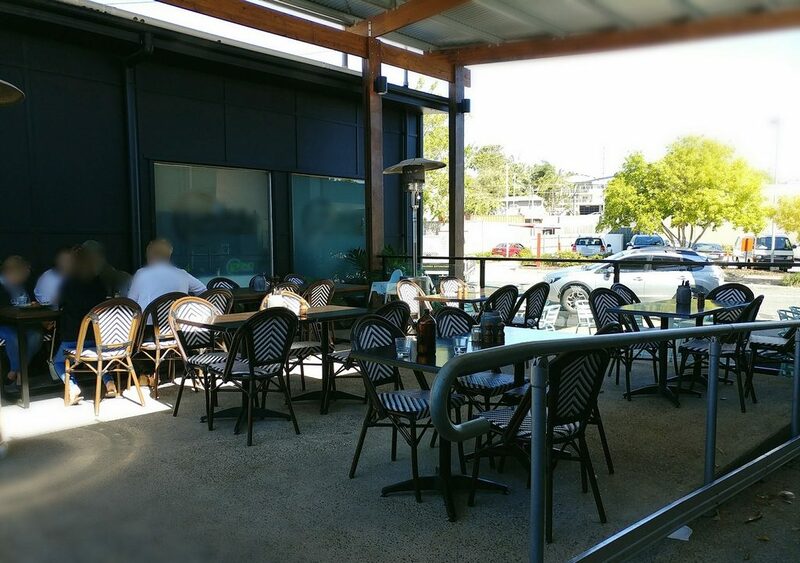 There was also a covered outside seating area, with about as many seats as there were indoors, with french cafe-style chairs and similar tables to those inside. As it was quite a gusty day though, we opted to sit indoors. Music played over the speakers inside at a comfortable volume, ranging from laid back house chillout music to the Jackson 5. 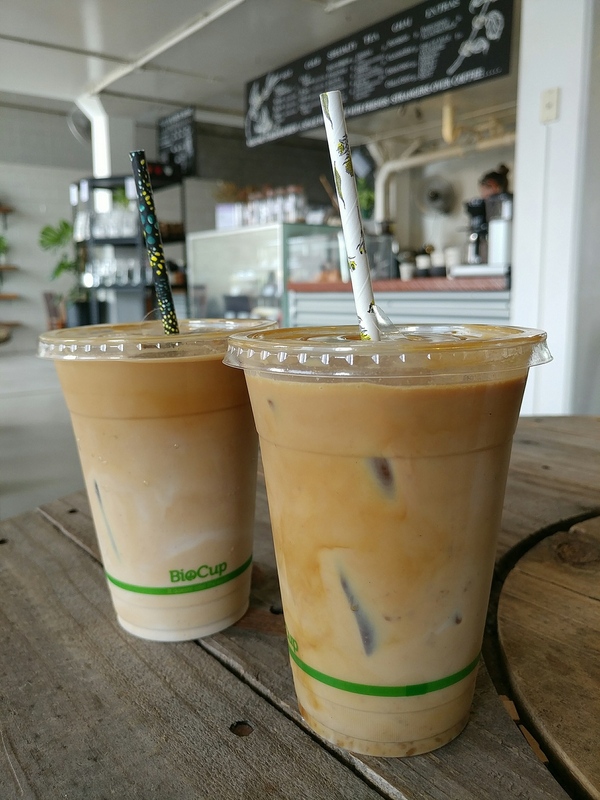 We ordered coffees, then set about looking through the menu, which was a couple of sheets of paper stapled together, with the All Day Breakfast items on the first sheet, and the Kids Menu, Sides, and Drinks on the second. Still in keeping with the theme, it had a sports mascot-esque logo of a wolf at the top of each page of the menu, along with the eatery name. 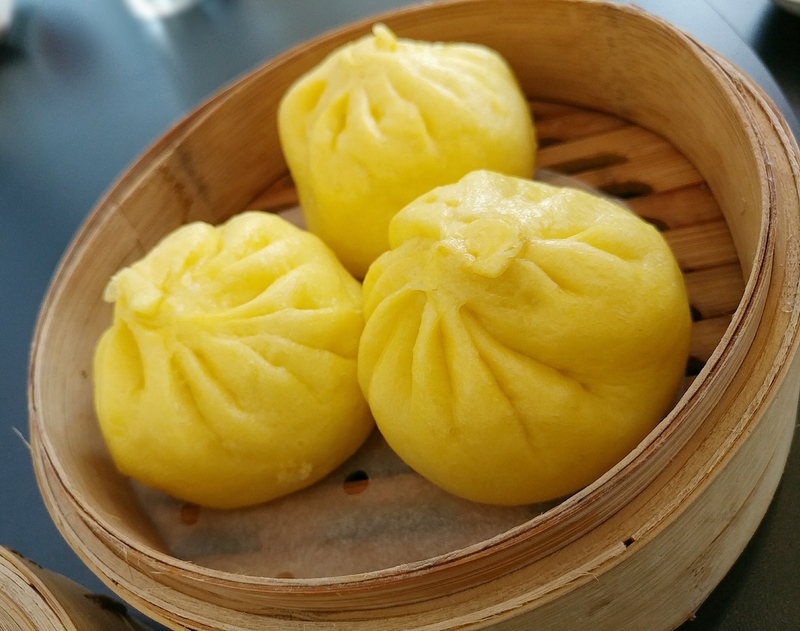 Although most of the food items were on a single page, there were plenty of tempting options to choose from, and we found ourselves torn between about four dishes. Despite being hungry, we weren’t didn’t have quite that much room, and eventually had to narrow our options down. While the Fried chicken french toast sandwich looked appealing, we had quite recently had Fried chicken and waffles at Duo West End, so thought we should have something different. We eventually chose the Crispy pork belly over the Pulled brisket sandwich on the information from the waitstaff, who said that that would be the more filling option (as stated, we were hungry), and also ordered the Wolf country pancakes, which, given their naming of it, sounded like it might be their speciality. The exposed rafters, and higher ceiling looking up. The coffees didn’t take long to arrive. 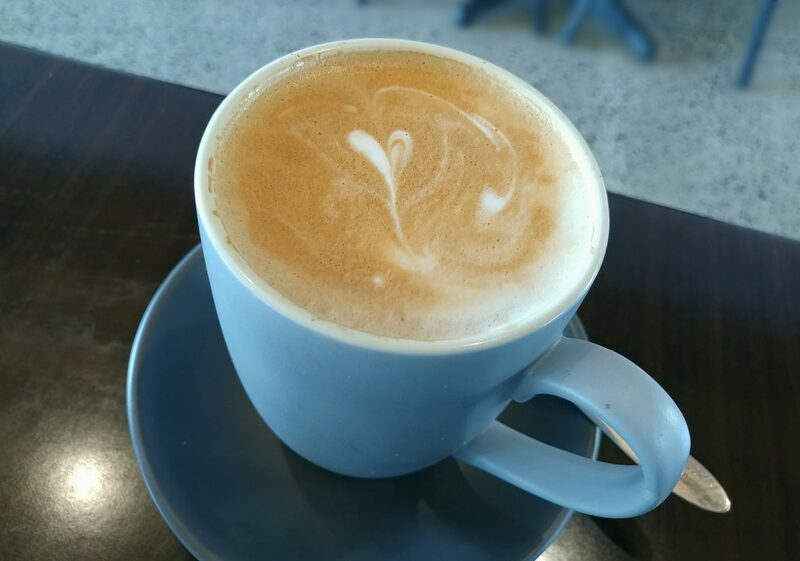 The flat white was found to be very smooth, with a good microfoam texture. It didn’t, however, have a particular coffee flavour. 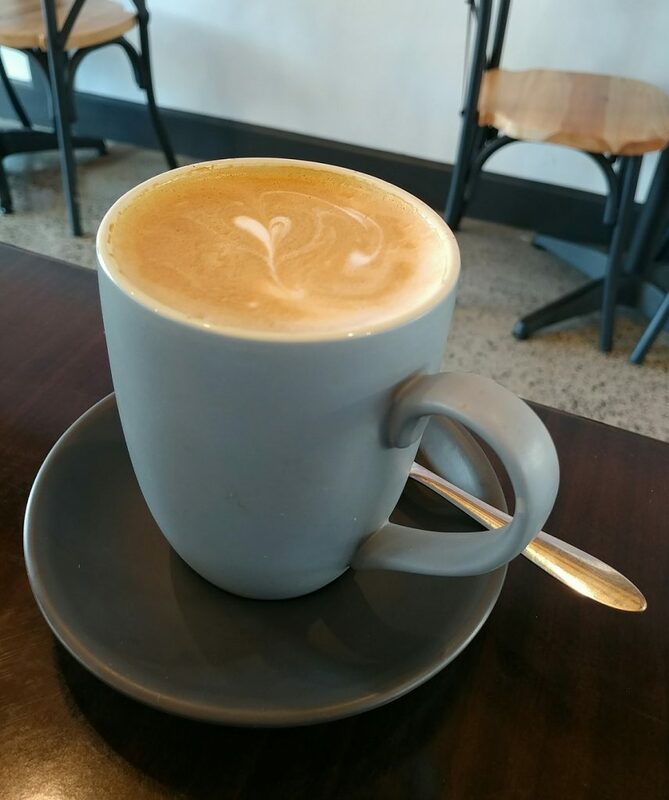 The flat white in a mug. Another look at the flat white foam. The iced latte was also smooth, slightly perfumed by the almond milk. There was no bitterness, but it too was missing any particular coffee notes. It certainly had good strong hues before the coffee shot was mixed in with the milk, but then it didn’t have the same strength of flavour. 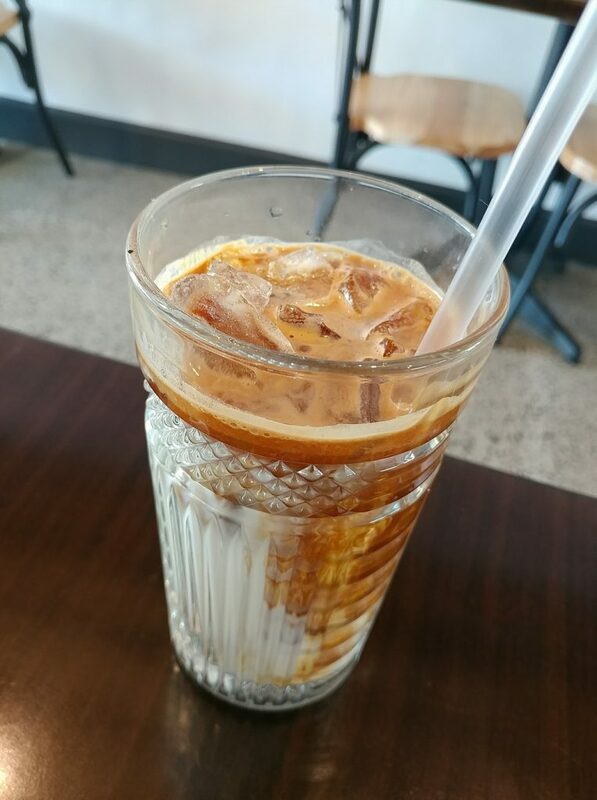 The iced latte. with a strong-looking coffee shot. 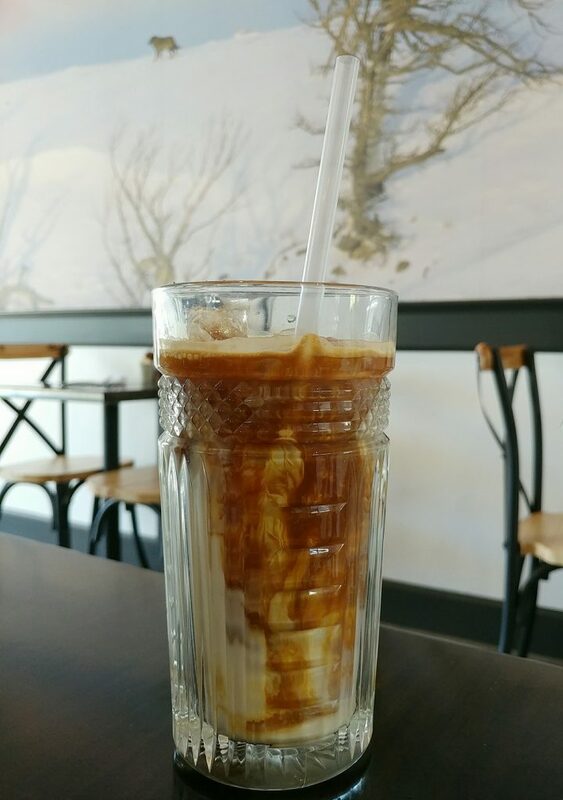 The iced latte from another angle. 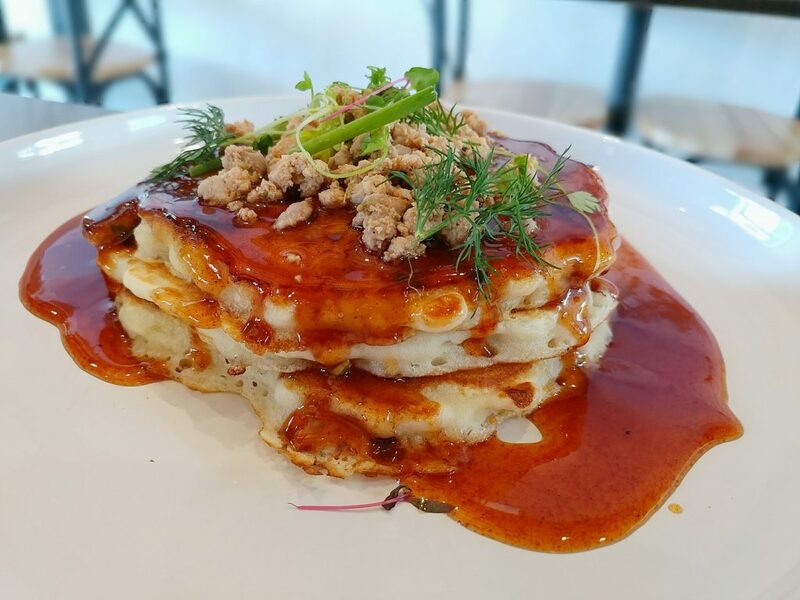 The Wolf country pancakes were listed on the menu as coming with spring onion, jack cheese, bacon with pork and fennel sausage crumble, and chipotle and bourbon spiked maple. The syrup had a rich caramel brown shade, and made a glossy pool where it was poured over the stack of pancakes. The pancakes were soft and had a squishy fluffiness, and had herbs in the batter mix, imparting extra flavour. 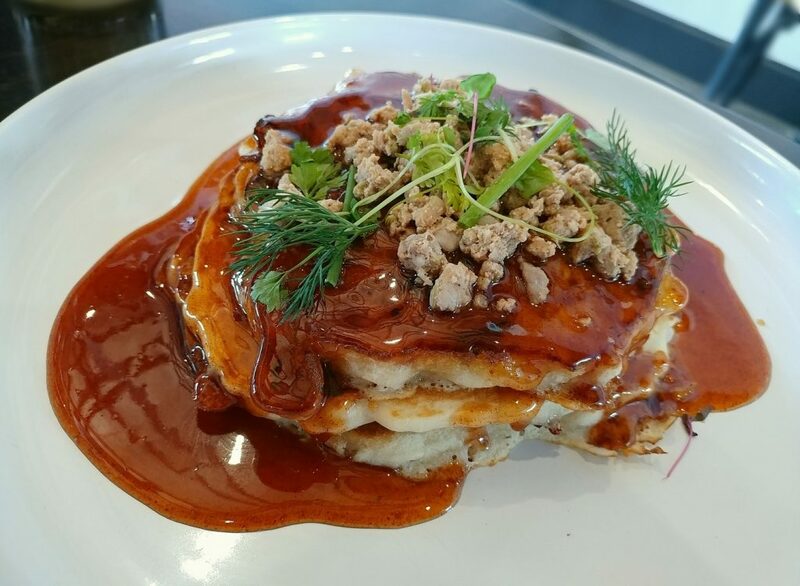 The syrup was smoky and a little spicy, and definitely carried a savoury note. It was not overpowering, but balanced the sweetness of the maple syrup. 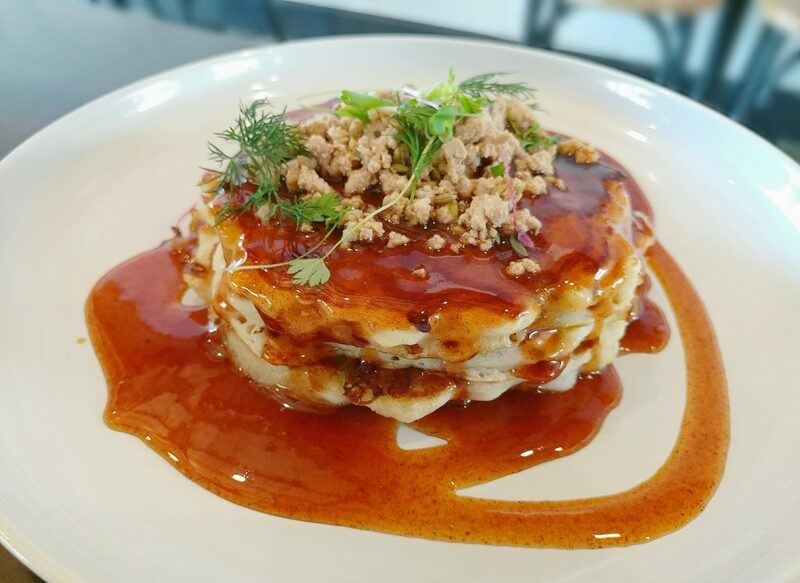 The bacon, pork, and fennel sausage crumble that topped the pancakes also had herby flavours, accentuated by the fresh fennel, coriander, and chive leaves scattered over it. 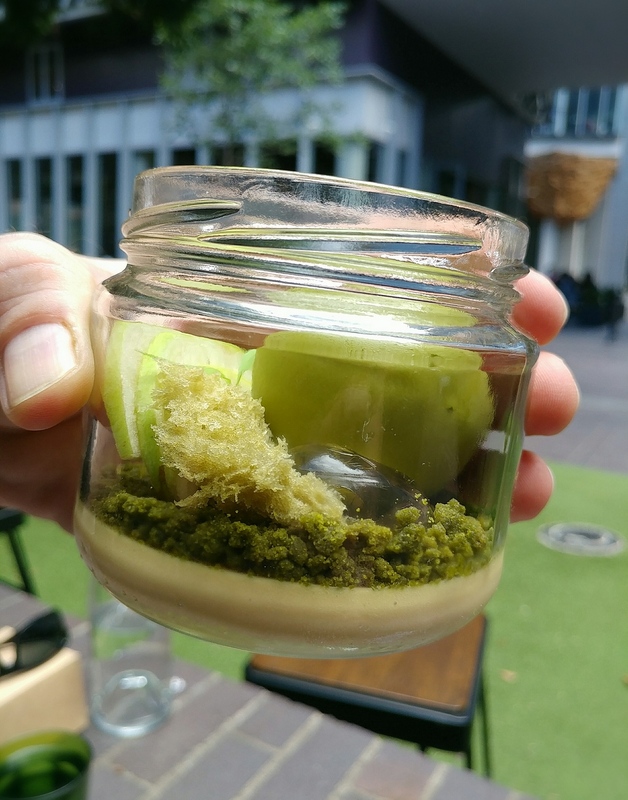 While it was quite a nice flavour mix to begin with, by the time we were halfway through, it felt quite monotonous, as each bite was similar in flavour and texture to the last. We felt that it needed more meat to be substantial, and we could not really discern the jack cheese being present. It could also have used a crunch element, so it wasn’t just all squishy mouthfuls. 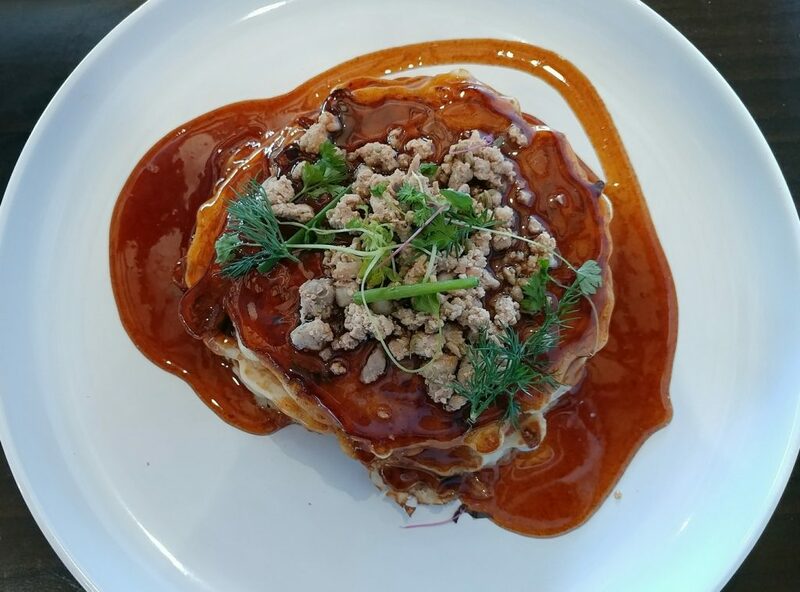 The Wolf country pancakes, with spring onion, jack cheese, bacon with pork and fennel sausage crumble, and chipotle and bourbon spiked maple syrup. 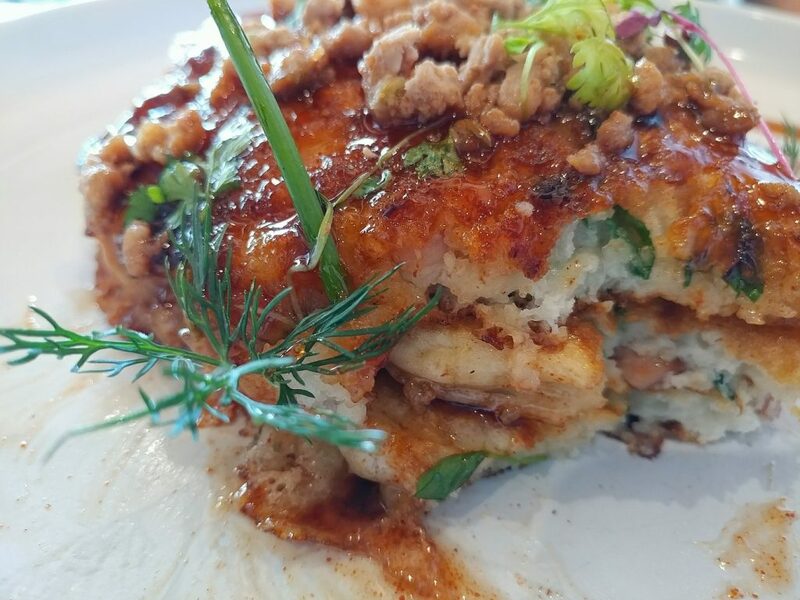 The dish from another angle. Look at the maple syrup gloss..
A look at the inside of the pancake stack. 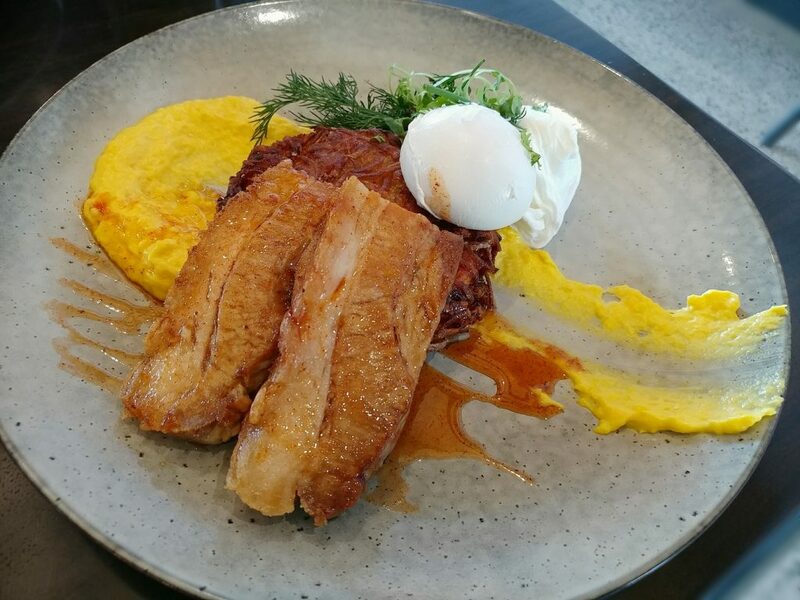 The other dish was Crispy pork belly with sweet corn puree, potato rosti, poached eggs, and smokey paprika honey. 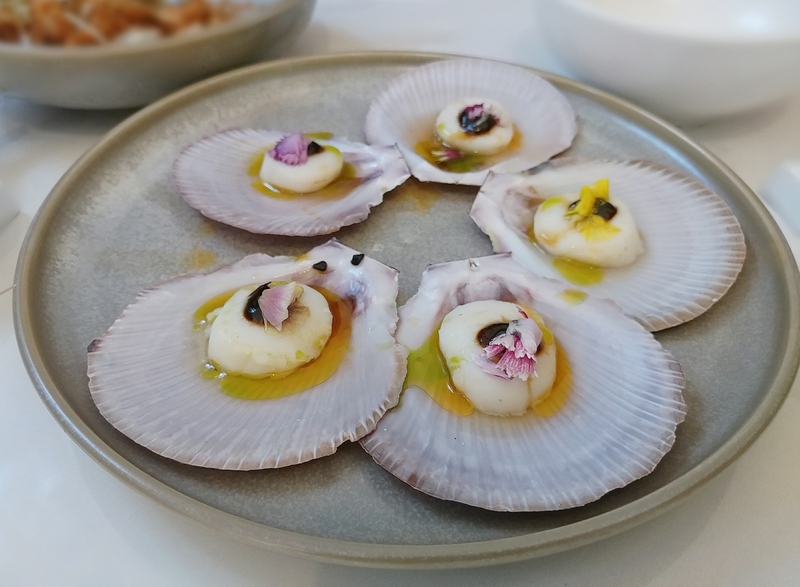 The sunshine yellow sweet corn puree made a bright smear across the plate, on which the other elements were placed. The pork belly was served in a couple of slices rather than a thick slab. The meat was nicely cooked through, so it was not dry, and the fat was soft and gelatinous. It did have crisp edges, though not the crunchy crackling one usually associates with a crispy pork belly. The smoked paprika honey was drizzled across the pork, acting like a sweet glaze, and adding a little moisture to the meat texture. Together, they made a not too salty, but also slightly sweet mouthful. 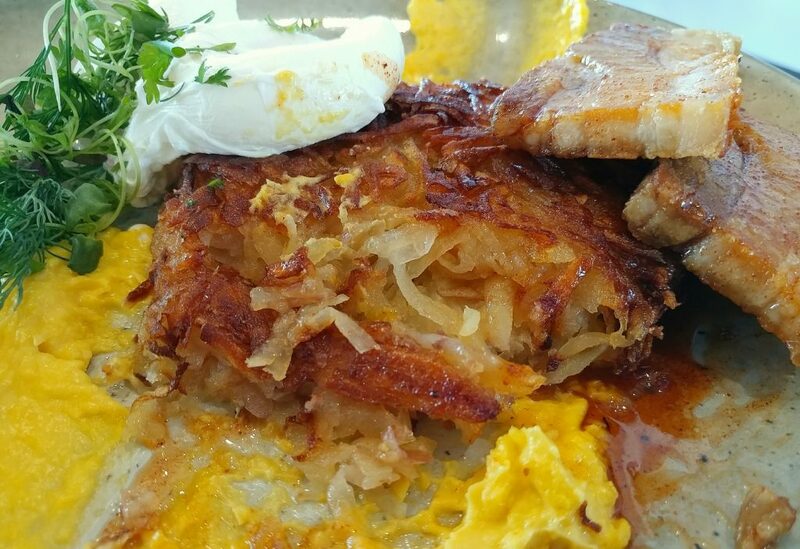 The potato rosti was promisingly browned, and was actually crisp on the outside. 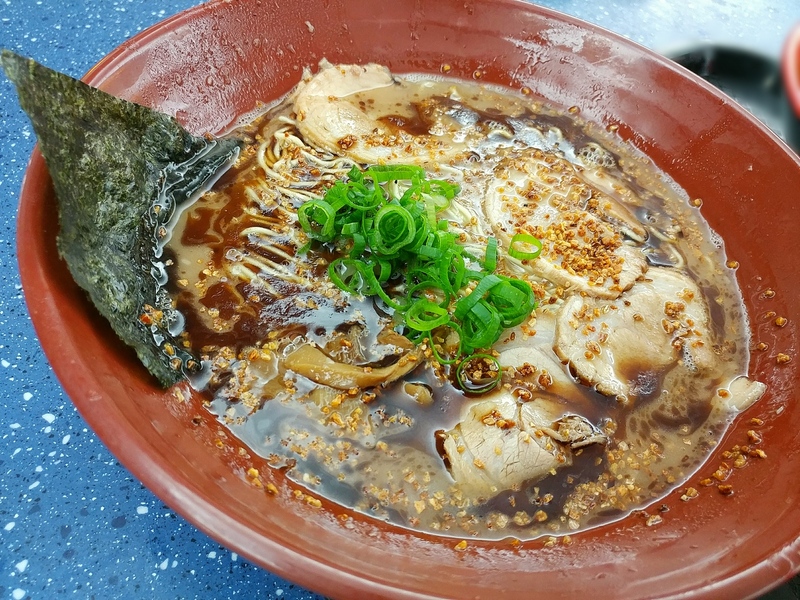 It was quite a light version, made of a nest of thin, almost translucent potato strips that had an unexpectedly vegetably crunch. The sweet corn puree was smooth, creamy, and only slightly sweet. The poached eggs had appropriately runny yolks. 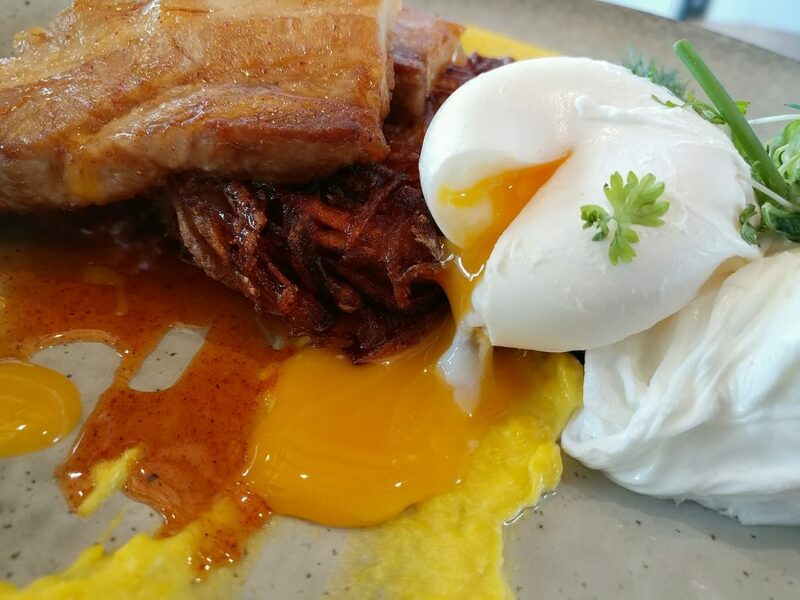 This was a dish with more variance and interest than the other, although given the preamble about how filling it would be, we had expected that there would be more pork belly. 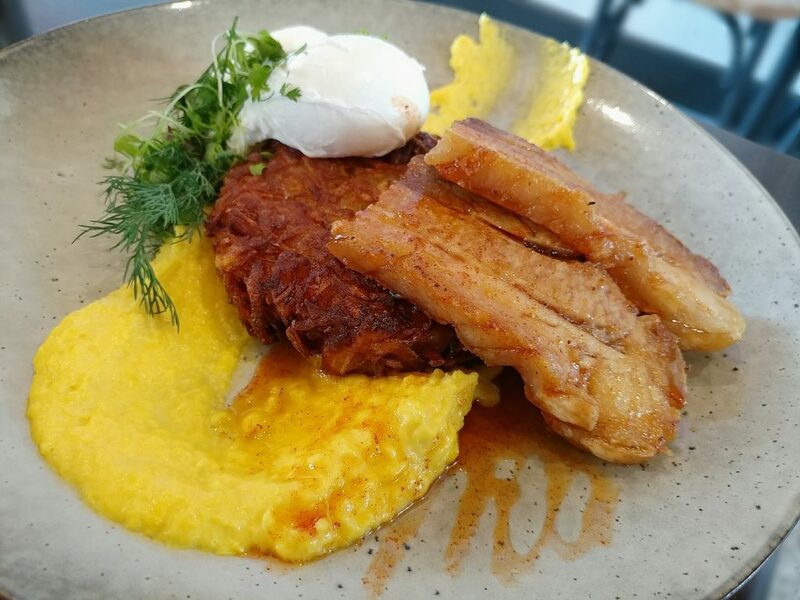 The Crispy pork belly dish, with sweet corn puree, potato rosti, poached eggs, and smokey paprika honey. The dish with the pork belly slices in better view. Apart from the initial glitch, waitstaff were friendly and upbeat, and the banter was amusing. 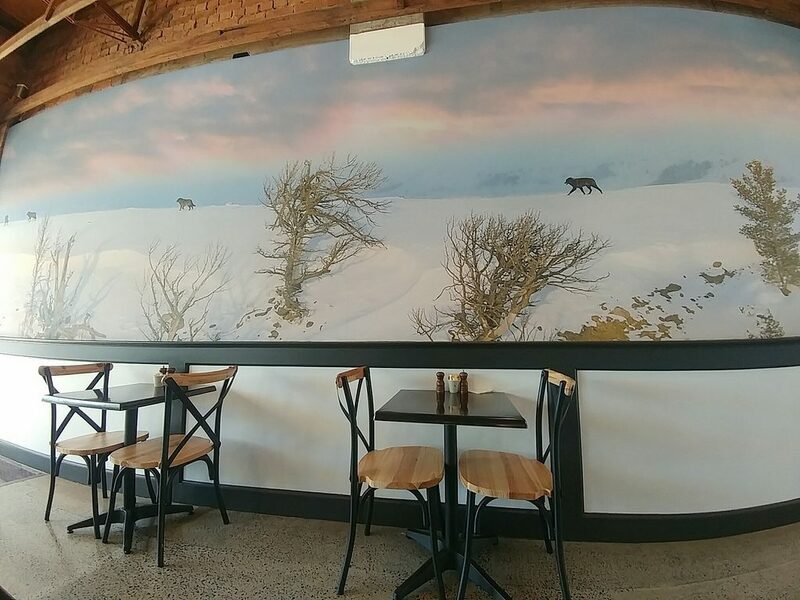 Overall, we found the food at Where The Wolves Eat a little hit and miss. Perhaps we should have gone with some of the other options we had been considering instead.. There is certainly promise in that menu. It is quite a nice space, and in summer, patrons will probably appreciate being able to pretend they are somewhere arctic. A last look at the pancakes. Price point: $17 to $22 for things more substantial than eggs on toast.